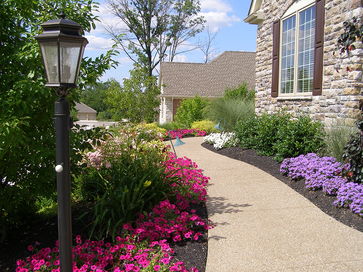 An often neglected part of the average home is landscaping. On average, landscaping can add up to 20% more to the value of your home! The important thing to remember, though, is that the landscaping be well thought-out as well as attractive. Anyone can plant a few flowers, but having a good design along with a variety of plants can significantly increase your home value. Using a professional landscape company to come up with a plan has many benefits. For one, they have experience in the area with different plants and know what grows well in different areas of your yard. The landscaper will also be able to maintain the plants as they grow into maturity, making your home all the more appealing. They will also have the equipment to make significant changes in your landscape, such as cutting out flower beds or moving large trees. Fruit trees are an exceptionally valuable landscape addition. What potential homeowner doesn't like the idea if picking their breakfast out of the back yard? The Florida climate is especially suited for a variety of citrus, pear, peach, and cherry trees. Check with your local garden center to see what trees work best in your area. Using mulch or rocks can also break up an otherwise average yard They create visual appeal and separate different areas of your landscaping. Mulch is designed to degrade over time, so it is important to replace it on a regular basis. Rocks can last forever, but it is important to to keep in the beds and not in the lawns where they can get thrown by mower blades. So think about how your landscaping can improve and don't be afraid to make some changes to turn your landscape into a paradise and increase the value of your home.